Anyway, the email says, in part, "This vote is an expression of my determination that we hold the Bush administration accountable. Dr. Rice is a principal architect, implementer, and defender of a series of administration policies that have not made our country as secure as we should be and have alienated much-needed allies in our common cause of winning the war against terrorism." 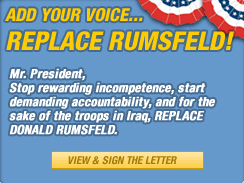 It also implores recipients to sign a "Replace Rumsfeld" petition that supposedly 700,000 people have signed. Makes you think this guy might want to run for president some day.